President Trump’s ambassador to the United Nations, Nikki R. Haley, has resigned in a high-profile departure of one of the few women in the president’s cabinet. 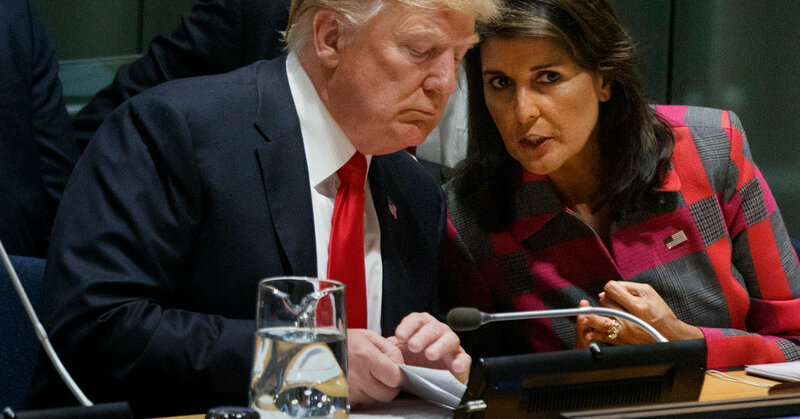 Ms. Haley, a former governor of South Carolina, had been an early and frequent critic of Mr. Trump, so when he named her the envoy to the world body weeks after his election in November 2016, the appointment was seen as an olive branch. Speaking to reporters in the Oval Office, Mr. Trump said Ms. Haley had informed him six months ago that she wanted to take a break after finishing two years with the administration. Ms. Haley, who has long been seen as a potential presidential candidate, said she had no intention of running for the presidency in 2020, as has been speculated. Instead, she said, she plans to campaign for Mr. Trump’s re-election. Mr. Trump said he hoped Ms. Haley would return in a different role, and would name her successor within the next two or three weeks. The daughter of immigrants from India, Ms. Haley favored free markets and global trade and earned international attention for speaking out against the Confederate battle flag in the aftermath of the 2015 massacre at a black church in Charleston. During Mr. Trump’s presidential campaign, she sharply criticized his demeanor and warned what it might mean for American diplomacy — even suggesting that his tendency to lash out at critics could cause a world war. As ambassador, Ms. Haley was an outspoken and often forceful envoy — someone whom foreign diplomats looked to for guidance from an administration known for haphazard and inconsistent policy positions. She was quick to voice her own opinions on the big policy issues that are high on her agenda, like Iran and North Korea. Ms. Haley acknowledged her policy disagreements with the president in an op-ed in the Washington Post last month when she criticized an anonymous senior administration official who penned an opinion piece in The New York Times, describing a chaotic administration in which many of the president’s aides disagreed with their boss. Ms. Haley also collided with the national security adviser, John R. Bolton, after she announced that Mr. Trump would lead a session of the United Nations Security Council devoted entirely to Iran. After European officials protested that this would showcase divisions in the West because of Mr. Trump’s decision to pull out of the Iran nuclear deal, the White House broadened the theme to countering weapons of mass destruction. Mr. Bolton did not criticize Ms. Haley. But as a former ambassador to the United Nations, he drove the decision to shift the agenda. White House officials noted that under United Nations rules, Iran would have been entitled to send its president to the meeting — setting up the awkward possibility that Mr. Trump would have sat across a table from Iran’s leader. Ms. Haley also has cast herself as someone able to sway her mercurial boss on issues like Russia sanctions, refugee resettlement and the value of the United Nations itself. She was the first cabinet-level United Nations ambassador for a Republican administration since the end of the Cold War, and quickly made clear she saw the position as a steppingstone to a higher political office — a possibility that Mr. Trump may have resented. Earlier this year, Republicans close to the White House whispered about the possibility that Ms. Haley and Vice President Mike Pence run as a ticket together as early as 2020. However, Mr. Trump plans to run for re-election. While Ms. Haley was among the few women in Mr. Trump’s cabinet, she is far from the first United States woman to hold the United Nations ambassador position. She succeeded Samantha Power and Susan E. Rice, who both worked for former President Barack Obama. Other women envoys from the United States to the world body have included Madeleine Albright, Jeane Kirkpatrick, Anne Patterson, Rosemary DiCarlo and Michele Sison. In a January 2016 response to President Barack Obama’s State of the Union address, she warned against following “the siren call of the angriest voices,” a clear rebuke of Mr. Trump. And in December 2017, Ms. Haley said that women who had accused Mr. Trump of sexual misconduct “should be heard,” a surprising break from the administration’s longstanding assertion that the accusations were false and that voters rightly dismissed them when they elected Mr. Trump. In August 2017, when Mr. Trump casually said at a televised news briefing that his administration could not rule out a “military option” to respond to the crisis in Venezuela, Ms. Haley was visibly dismayed. On April 15, Ms. Haley announced that the administration would place sanctions on Russian companies found to be assisting Syria’s chemical weapons program — part of a menu of options to retaliate against a suspected gas attack that killed dozens on April 7. Compounding her political difficulties, that same weekend, the White House blocked a plan under which one of her advisers, Jon Lerner, would also advise Mr. Pence on national security policy, in a dual role. Mark Landler and Eileen Sullivan contributed reporting.